SB Architects and the Mission Hills Group are pleased to announce the completion of Mission Hills Volcanic Mineral Springs and Spa, one of the world’s largest spa destinations, on Hainan Island, China. The design of this world-class destination is a collaborative effort of two of the world’s leading designers of luxury destinations — San Francisco-based SB Architects and Ft. Lauderdale, Florida-based landscape architects EDSA. The spa complex is a major component of Mission Hills — Haikou, an expansive five-star resort that will include 10 golf courses. Located off China’s southern coast, Hainan Island is the country’s only tropical island, with topography and climate similar to that of Hawaii. The 21-acre Mission Hills Volcanic Mineral Springs and Spa is home to the largest natural springs reserve in the region. The Spa at Mission Hills is the central defining feature of the expansive complex, surrounded by gardens, over 150 springs and water features, and treatment venues inspired by each of the five continents. Twenty-nine spa villas provide an exclusive, private retreat within this expansive resort destination. "We are proud to introduce this project to a global audience," said Scott Lee, president of SB Architects. "We believe we have created a destination that sets the standard by which design, service and the spa experience are measured on Hainan Island and throughout China." 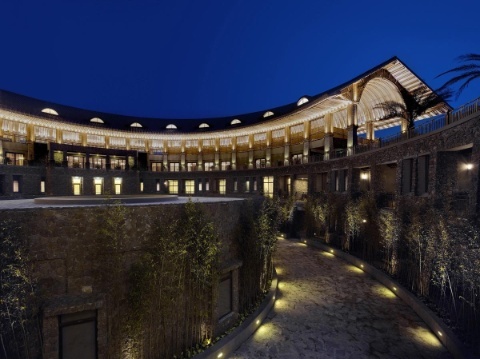 Featuring 61 spa treatment suites, the spa takes its design inspiration from the traditional Hakka Earthen Fortress Villages of Southern China, which have been recognized as World Heritage Sites. The iconic main structure is comprised of soaring, semi-circular bamboo rising from a massive lava stone base, fusing western and oriental design elements while honoring the Chinese philosophies of balance and harmony. In over 50 years of practice, SB Architects has established a worldwide reputation for excellence in the planning and design of hotels, resorts and resort communities, as well as urban mixed-use and multi-family residential projects. A mid-sized firm by design, SB Architects combines the technical expertise and global understanding of a large, global firm, with the hands-on, collaborative approach of a boutique practice. With projects spanning six continents, SB Architects has built a long-standing reputation for site-sensitive design, and the ability to create and maintain a strong design vision. www.sb-architects.com .